As a society we have this belief in what I like to call the ‘affordability myth'. It’s the idea that the cheaper food is, the more affordable it is. That seems logical, but it’s not true when you look at the big picture. The price we pay for food at the checkout is not the total cost of that item. There are other costs - some with dollar values and others that just can’t be quantified. We pay for them with our money, health, society and environment. These hidden costs are called externalities. As I began looking for information on the topic, I found that a lot more research still needs to be done. There are many sources that give information on just a sliver of the external costs and few that look at them all together. As I read more and more about externalities, I recognized that they can be broken into 4 main groups; health, economic, social and environmental. However, these issues are all connected. For example, the environmental issue of soil degradation connects to health issues. 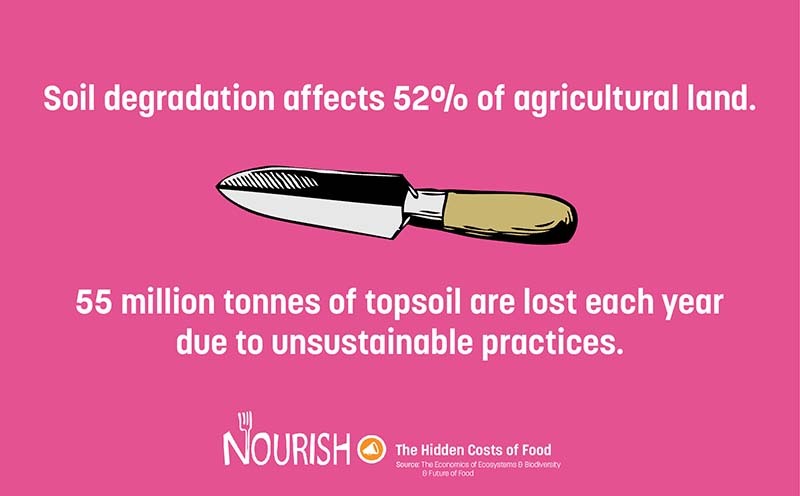 When there are less nutrients in the soil, there are less nutrients in the food grown in it. According to the USDA, since the 1950s vitamin C content has decreased by 20% and Riboflavin by 38%! Soil degradation also connects to economics, as that can often be the reason for it. If farmers cannot sell locally, then they may not be able to financially support their farm. This means they are forced into monoculture which strips the soil of key nutrients. They are forced to grow food they can sell to mass producers, supporting the global food system. They often grow crops such as corn that will be turned into processed junk food. This processed food adds to the health costs and diet related issues. Obesity rates in Canada have have grown from 9.7% to 37% between 1970 and 2009. Not to mention all of the additional transportation and processing related pollutants, and the environmental cost associated with that. Soil degradation can also be due to unsafe pesticides. The use of unsafe pesticides brings social issues into the picture. A study of hispanic, agricultural workers who work with chemicals in California showed that they were up tp 70% more likely to develop some types of cancer than the general population. To me that sounds like something out of a dystopian movie, not something that should be happening in real life. Why should someone else's life and health be sacrificed to make our food cost less? And that’s just following the trail of one issue. I could not believe how the effects and costs cascaded. I would not have thought of all these things while buying my groceries just a few weeks earlier. Now, I find myself thinking twice about what products I purchase. Where were these grown? Who grew them? What are the hidden costs? It also got me thinking about what could be done to address this. Of course, large scale policy changes are what’s really necessary. Supporting non-profits like Food Secure Canada and the Global Food Alliance, as well as local leaders who care about sustainable food systems are one way to do this. You can also make small changes in your own life, such as buying local and organic, growing your own food and spreading awareness. Some say food is the most affordable it’s ever been. If you ask me, looking at the big picture, it’s the most expensive and we cannot afford to continue this way.